Using a NEC projector allowed a San Francisco art museum to present the unexpectedly colorful past of ancient sculptures and artifacts. To help visitors better connect with the works of the ancient Mediterranean by presenting this art as its contemporaries would have seen it  vibrantly colored and eye-catching  through a combination of technology and painstaking research. A NEC PA803U projector is be used to project colors onto a frieze next to an identical reproduction of the original frieze. 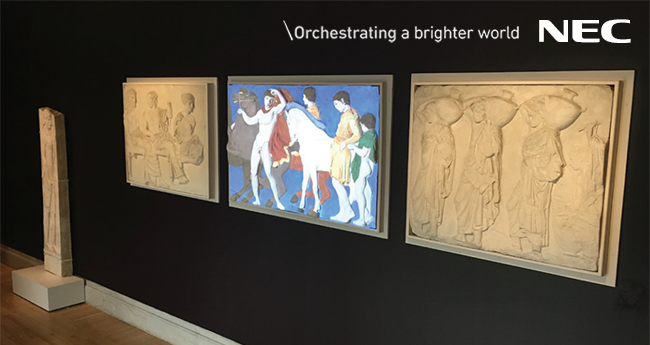 Lighting treatment projected by the NEC projector onto the replica would fade in and out within a 12-second span, allowing visitors to see the same frieze in its original colors as well as its current monochrome state.